Theatre at eight-thirty in the morning may be a little early in the day for some, but the timing was perfect for the York College Traveling Children's Theatre. 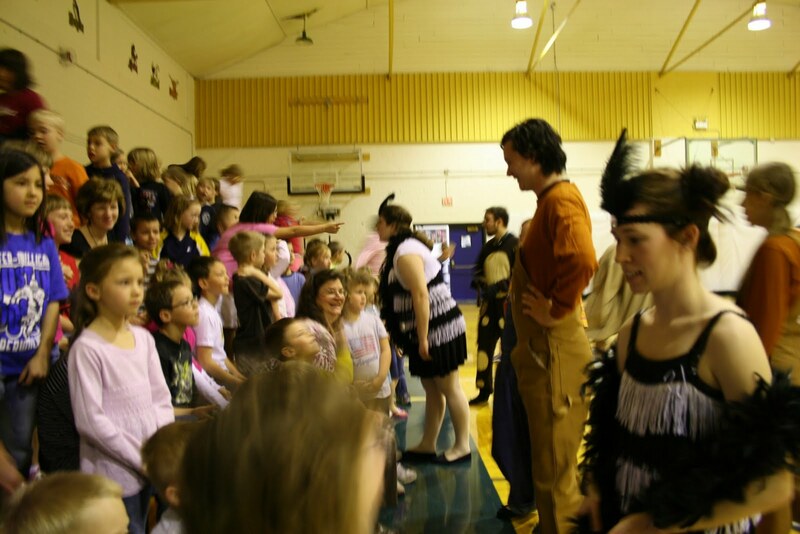 The theatre group made a stop on their whirlwind 22 show run at Exeter-Milligan Elementary School last Thursday morning and brought laughter, applause and a whole lot of theatre to the students. The company which includes twelve student cast members in addition to assistant director Kayla Lawrence and director John Baker III, auditioned last November and started rehearsing in January. The show, In One Basket, was written by Shirley Pugh and weaves together twelve folk and fairytales from around the world. The general theme of the short scenes was to be happy with what you have right beside you. The students roared with laughter when the rich man paid his noisy neighbors to move and they just moved into each others homes still leaving him with noisy neighbors. A husband and wife who misused three wishes ended with the statement "happiness comes when you don't have any wishes at all." Throughout the twelve mini scenarios the theme continues with the mother of "Gustav" who always finds her son right no matter how many mistakes he makes. The "Tale of a Mouse" in which a mouse hunts high and low for a mate and then find him in the field outside her house embodies this theme in plain language but was funny enough to keep the students and adults engrossed. The actors showed an amazing amount of variety in character, costume and scenery. There was plenty of action to keep even Kindergarteners still in their seats. At the end of the program the actors introduced themselves, including their year in college, their hometown and their major. While many are arts majors some major in very different fields. The actors mingled with the crowd again after the show and answered the elementary students questions. Before leaving, the group invited the students to a backstage tour and showed their costumes, props and sound effects items. If you won't have the opportunity to see this entertaining performance at a local elementary school, the York College Traveling Children's Theatre will be performing their show for the general public on April 16th at 7:00 p.m. in Gurganus Hall on the York College campus.